Fear is a powerful motivator. It’s also a very interesting social behavior. Fear is a psychological tool that animal species use as a mechanism for avoidance. Fear is one of our most basic emotions and is processed by a part of the brain called the amygdala. Animals, including humans, can have genetic predispositions toward fearing certain things. This has great adaptive value. For example, as I’ve written about previously, many prey animals are naturally fearful of their predators. Mice don’t have to learn to avoid snakes and cats; they are born fearing them. Many nocturnal animals have photophobia, which helps them stay out of moonlight and avoid being spotted. Inborn fears reveal past natural selection because animals that are naturally afraid of their main predators will be more likely to survive and pass on that genetically encoded fear. Fear can also be learned. During times of danger, alarm, or even stress, our amygdala activates the fear response. This serves to train us to fear that danger when we see it again and thus avoid it. If you were mauled by a dog when you were young, you have a good chance of being fearful of dogs the rest of your life. 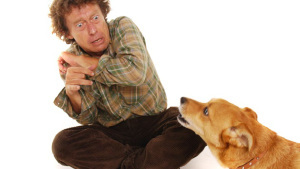 Repeated exposure to dogs may not even help because, often, exposure simply boots up the fear program again, which could actually reinforce, rather than diminish, the fear. 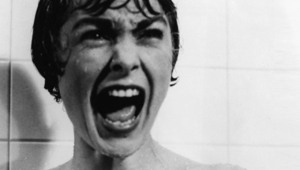 One cool aspect of fear is that it can be learned vicariously by humans and other animals. 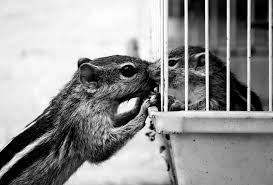 That is to say, social animals can learn to fear some dangers simply by observing others experience the danger and without having to experience it first-hand. This is powerfully adaptive for the obvious reason that it reduces exposure to danger even without a priming event. While vicarious learning of fear in nonhuman animals may have sounded far-fetched in previous decades, researchers on animal emotion and cognition have found that social mammals experience empathy and animal contagion. Animals are keenly aware of the emotional state of their fellow conspecifics, so it’s only natural that they would notice, and learn from, another animal in fear, pain, or danger. The first rigorous scientific study of vicarious fear training in animals was published in 1984 by Susan Mineka and colleagues. In that groundbreaking study, Professor Mineka showed that juvenile rhesus monkeys learn to fear snakes not necessarily through their own dangerous exposure but by observing their parents behaving fearfully around them. In other words, the fear of snakes in monkeys can be a function of social learning. Since that now-classic study, vicarious fear training has been observed in a variety of social animals and has been used to probe genetic fear dispositions, empathy, neurodiversity, and many other social and evolutionary phenomena. Researchers Carolyn Jones and Marie Monfils of the University of Texas recently discovered that vicarious fear learning in rats depends on dominance relationships. To do this study, Jones employed a clever spin on a common experimental design. Before doing any fear training, she placed three rats in a cage and let them live and play together from the time of weaning until the experiment was done, 12-14 weeks later. This way, she could observe and document the social relationships that formed. As she told me, “Rats are very commonly used in behavioral studies, [but] usually we just order however many rats are necessary for the experiment, put them in a cage together, run the experiment after an allotted ‘acclimation’ period, and that’s it.” By letting the rats bond first, she could ask if dominance status mattered in the second-hand learning of fear. Rats are very playful and social animals. They also exhibit dominance-based social ranking in their relationships. 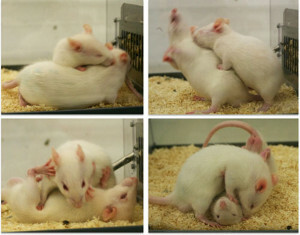 After watching each rat triad carefully for three weeks, Jones noted that one rat established himself as the dominant rat (D), another as submissive-1 (S1), and the third as the submissive-2 (S2). S1 is defined as the preferred target of the D rat, while S2 is the least involved in play behaviors, tending to avoid the D rat’s play invitations. Once the social rankings were established, Jones selected one member of the triad to be the subject of fear conditioning involving the emission of a 20-second tone followed by a mild electric shock to the feet. This rat would quickly learn to fear the tone and so this rat is called the fear-conditioned (FC) rat. The next day, Jones placed the FC rat together with one of the other rats, and then played the tone, this time without a shock. The FC rat became fearful upon hearing the tone and then second rat did (or did not) pick up this fear from the first one, without any shocks being delivered. This rat was then called fear-conditioned-by-proxy (FCbP). On the third day, all three rats were put together again, the third rat not having been trained to fear the tone either with shocks or by-proxy, so was called “No FC.” Tones were played again and the fear responses were measured. In these experiments, fear was measured as “freezing behavior.” The experiments were run in all possible combinations of dominant and submissive rats playing the role of the FC, FCbP, and No FC. With six replicates for each type of triad and 96 rats in total, robust statistical analyses were possible. The results were both surprising and clear. The S1 rats (the submissive rats that were the preferred target of the dominant rats) were able to become fear-conditioned by-proxy regardless of whether they took their training from the D rat or the S2 rat. The S2 rats, however, would only learn fear from the D rats, not the S1 rats. Further still, the D rats did not become fear-conditioned by-proxy from either the S1 or S2 rats. In other words, dominant rats would never learn fear from submissive rats; the play-avoidant submissive rats would only learn from the dominant rats; and the playful submissive rats would learn from both superiors and other submissives. Jones then went on to study the vocalizations that took place during the fear-condition by-proxy attempts, as a means to possibly explain why fear-learning takes place in some combinations and not in others. She focused on low-frequency calls that rats sometimes make that correspond to negative emotions, including fear. Aside from big mouse-to-mouse differences with most mice not vocalizing at all, Jones found that the low-frequency vocalizations, when they did occur, correlated well with the learning of fear by-proxy. this is, some of the rats that learned to fear the warning tones may have done so because the FC rats were giving a warning to them. The use of warning calls to signal the danger may provide the explanation for the fear-condition because it makes sense that rats would call out danger to warn those they have social alliances with while being less likely to warn animals they are indifferent to. As Jones told me, “the fear-conditioned demonstrators were more likely to emit alarm vocalizations if they had, for lack of a better word, a ‘friendly’ relationship with the observer rat.” Rats, it seems, look out for their friends. The study goes on the explore serum corticosterone levels, expression of c-FOS in two different areas of the rats’ brains, and other mechanistic items of interest to those who specialize in the neuroscience of fear. The main take-away from this study is that rats, like humans, experience their world through the lens of social contact. Those of high social rank are more influential on others, while being less likely to be influenced by others. Those of lower social rank, on the other hand, have their own advantage: by paying attention to both superiors and other subordinates, they are able to learn from all of members of the group equally. FDR famously said, “The only thing we have to fear is fear itself.” But when it comes to learning from others, evolution has seen things differently.